Zhenren (Chinese: 真人; pinyin: zhēnrén; Wade-Giles: chen-jen; literally "true person") is a Chinese term meaning "Daoist spiritual master," roughly translatable as "Perfected Person." The first recorded usages of zhenren ("true person") are in the Daoist text Zhuangzi (莊子) (ca. third-second centuries B.C.E. ), where “zhenren” refers to a sage or holy man, a person who has reached an ideal state of existence. Later Daoist texts developed an other-worldly, mystical concept of zhenren. The honorific title Zhenren was given to Daoist sages. A fourth century text, the Ziyang zhenren neizhuan (紫陽真人內傳, "Inner Biography of the True Person of Purple Yang"), names “zhenren” as the highest of three degrees of xian (immortality) in the celestial bureaucracy. A “zhenren” is a Taoist ideal, a person who lives completely and naturally in harmony with the Tao. By the seventh century, the term “zhenren” was being used in Chinese Buddhist texts as a translation of arhat (真人, "enlightened one"). The term zhenren ("true person") has been used in a number of other contexts by Chinese writers. From the end of the first century B.C.E., it was used as a name for sage-rulers. The Book of Han (fifth century C.E.) contains the earliest recorded example of the usage of zhenren to mean "honest person, well-behaved person." Zhenren has also been used as the name of a star, an evolutionary term, and in the names of several folk heroes. The concept of “zhenren” continues to intrigue modern scholars, who strive both to better understand its meaning in its historical context, and to develop new interpretations in a contemporary context. While the Dao De Jing has the first occurrences of the term zhen ("true; real; etc. 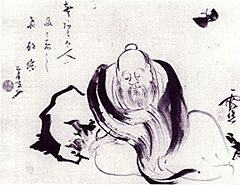 "), the first recorded usages of zhenren ("true person") are in the Daoist text Zhuangzi, (莊子), attributed partially to Zhuangzi, an influential Chinese philosopher who lived around the fourth century B.C.E. Practically all extant editions of the Zhuangzi are based on a recension 700 years later, written by Guo Xiang (c. 300 C.E.). Watson translates gu zhi zhenren (古之真人) as "True Man of ancient times" and "True Man of old," which appears seven times in the Zhuangzi. The Huainanzi (second century B.C.E.) mentions zhenren ("true person") 11 times. One Huainanzi chapter uses zhenren to describe a spiritual state in which "closing the four senses" results in one's jing (精, "essence") and shen (神, "spirit") returning to the ultimate Daoist zhen (真, "truth"). The scholar and translator Charles Le Blanc suggests that the passages in the Huainanzi synthesize the concept of the "other-worldly" zhenren "True Man" with the "this-worldly" shengren "Sage." In earlier pre-Han works, the expression "zhenren" always refers to a quasi-mystical and contemplative state of detachment from the affairs of the world. According to Huainanzi the “zhenren” remains detached and does not reveal his true greatness during times of peace, but manifests world-shaking power in times of chaos. Shou zhi "Maintaining Resolution" also uses it, translated here as "Immortals." The Daoist Liezi (ca. fourth century C.E.) uses zhenren in two chapters. The first usage (3, tr. Giles, 1912, 60) refers to the Zhuangzi (6) saying zhenren slept without dreaming. Zi Chan is perplexed and speechless, so he goes back to Deng Xi who explains, "You are living together with real men without knowing it. Who calls you wise? Cheng has been governed by chance, and without merit of yours." The little-known Daoist text Wenzi has 17 occurrences of zhenren. According to Chinese scholar Daniel Coyle, the concept of “zhenren” took on a more religious significance from the period of the Han to the Six Dynasties and became central to Daoism. A “zhenren” was a person who achieved “immortality” through being elevated to a macrocosmic perspective and becoming part of a totality of existence. The honorific title Zhenren was applied to Daoist sages. Zhou Yishan (周義山, b. 80 B.C.E.) was called Ziyang Zhenren (紫陽真人, "True Person of Purple Yang"), a name later applied to Zhang Ziyang (張紫陽), author of the Wuzhen pian (note zhen "reality; perfection" in the title). The Ziyang zhenren neizhuan (紫陽真人內傳, "Inner Biography of the True Person of Purple Yang") (fourth century C.E.) named zhenren as the highest of three degrees of xian, occupying the upper rank in the celestial bureaucracy. After originating in early Daoist texts, the zhenren "true person" was semantically expanded to mean Buddhist arhat and miscellaneous senses such as "honest person." Chinese Buddhists adapted zhenren (真人) to translate the loanword arhat or arahant ("one who has achieved enlightenment"), which was also transcribed as aluohan (阿羅漢) or luohan (羅漢). Buddhist usage contrasts zhenren ("arhat") with niren (逆人, "contrary person; hateful person; unprincipled person"). The oldest example is found in the Tang Dynasty Buddhist dictionary Yiqie jing yinyi (一切經音義, "Pronunciation and Meaning in the Tripitaka") (seventh century), edited by Xuan Ying (玄應). Chinese zhen ("true") was used to translate various other Buddhist expressions. Mantra ("instrument of thought") translates as Chinese zhenyan (真言, "true words") and Japanese Shingon Buddhism. Tathata ("thusness, suchness, the unconditioned, unchanging reality") is Chinese zhenru (真如, "true resemblance") and Japanese shinnyo (see Shinnyo En). Chinese authors have used zhenren ("true person") as a name for sage-rulers and honest people, the name of a star, an evolutionary term, and proper names. Zhenren can mean "heaven-sent ruler." Originating at the end of the first century B.C.E., the idea spread that a zhenren who had received the Heavenly Mandate (天命tianming) would appear to renew the world."" Emperor Guangwu of Han was called Baishui Zhenren (白水真人, "True Person of the White Water"), and Cao Cao of the Kingdom of Wei was also called a zhenren. The Records of the Grand Historian (ca. 100 B.C.E.) may have a classical precedent for this meaning. It records that the "First Emperor" Qin Shi Huang (r. 221-210 B.C.E.) was fascinated with xian immortality and decided to call himself zhenren rather than the homophonous Chinese honorific zhen (朕, "(imperial) I, we"). The emperor summoned the Daoist practitioner Lu Sheng (盧生) who said, "The zhenren enters water but does not get wet, enters fire but does not get burned, flies among the clouds, and has a length of life equal to that of Heaven and Earth" . The Taipingjing (太平經, "Scripture of Great Peace," 6th century C.E.) contrasts the zhenren who rules on earth with a shenren (神人, "divine person") who rules in heaven. Zhenren can mean "honest person; well-behaved person," nearly synonymous with zhenren (貞人, "person of high moral standing and integrity") and zhengren (正人, "honest/loyal man; gentleman"). The earliest recorded example is the Book of Han (fifth century C.E.) biography of Yang Yun (楊惲, fl. 1st century B.C.E.). This meaning is expressed in the idiom zhengren mian qian bu shuo jia (真人面前不說假, "don't tell lies in front of a true/honest person"). Among Traditional Chinese star names, Zhenren (真人) is a literary reference to Gamma Ursae Majoris, near the Big Dipper. In modern Chinese scientific terms for human evolution, zhenren means "true human," as distinct from other primates. Zhenren is the proper name of several characters in Chinese folklore (such as Taiyi Zhenren); Chinese mythology (Cihang Zhenren), and Chinese literature (Luo Zhenren). Note that Japanese 真人 can be pronounced shinjin in the Daoist sense and Masato (Masato Shimon) or Mahito (Mahito Tsujimura) as a given name. The common Chinese word zhen (真, "true; real; authentic") is linguistically unusual. It was originally written with an ideogram (one of the rarest types in Chinese character classification) depicting "spiritual transformation." It originated in the Daoist classic Dao De Jing and does not appear in the early Confucian classics. The archaic Chinese character 眞 was reduced into 真, which is the Traditional Chinese character, Simplified Chinese character, and Japanese Kanji. (Note the slight font variation between Chinese 真 and Japanese 真.) This modern character 真 appears to derive from wu (兀, "stool") under zhi (直, "straight"), but the ancient 眞 has hua (匕, "upside-down person); transformation" (ren 人 "person" backwards) at the top, rather than shi (十, "10"). This antiquated zhen (眞) derives from Seal Script characters (4th-3rd centuries B.C.E. ), It is tentatively identified in the earlier Bronzeware script (with 匕 over ding 鼎 "cooking vessel; tripod; cauldron") and unidentified in the earliest Oracle bone script. Duan Yucai's Shuowen commentary (1815 C.E.) confirms that zhen originally depicted a Daoist zhenren and was semantically extended to mean cheng (誠, "sincere; honest; true; actual; real"). It explains the ideographic components in Daoist xian terms, 匕 for hua (化, "change; transformation") (see the Huashu), the "eyes" (目, vision" in neidan practices), "conceal" (∟) for invisibility; and it notes three traditional xian conveyances into the heavens (qi, Chinese dragon, and qilin). Duan differentiates two semantic sets of words written with the zhen 真/眞 phonetic element and different radicals. The first words basically mean chongshi (充實, "real; solid; substantial; substantiate; fill out; strengthen"). The second set of words basically mean ding 頂 "crown (of head); top; tip; summit; prop up; fall down." The Modern Standard Chinese pronunciation of 真 is zhēn "true; real." Reconstructed Middle Chinese and Old Chinese pronunciations include tyĕn < *tśyĕn (Bernhard Karlgren), tśiɪn < *tjien (Zhou Fagao), tʃiĕn < *tien (Tōdō Akiyasu, 1964), or tśin < *tin (Axel Schuessler). Tōdō (1964, 743-745) envisions that the original "upside-down zhenren" ideograph pictured a sacrificial victim zhen 眞 "falling into; fitting into" a burial pit being tian 塡 "filled in," and proposes an etymon of *TEN "completely full; stuffed" (expanding upon Duan Yucai's examples above). Schuessler's etymological dictionary (2007, 610) cites Ming Dynasty and Yuan Dynasty transcriptions of tʂin. It suggests etymological connections with Tibetan bden-pa ("true") (see Two truths doctrine) and possibly Chinese zhēn (貞, "divination, divine; test; verify; faithful; loyal"). The root word of zhenren is zhen 真 "true; real; factual; genuine; authentic; actual; really; truly; indeed," which has a special Daoist meaning of a person's "true, original, undamaged character." One of these three zhen usages describes Dao ("Way") and the other two describe De ("integrity; virtue"). Note the diachronic improvements of these zhenren translations. In Chinese, ren (人) means "person; people; human" and not "man," which is nan 男 "man; male"
There are semantic advantages to English translations of zhenren as a "Person" who is "Perfected," "Realized," or "Genuine." Another possibility is "Actualized Person" in the psychological sense of self actualization. More than two thousand years after it was first articulated in China, the concept of “zhenren” continues to intrigue and inspire thinkers of many philosophical backgrounds. As Daoism has gained popularity and taken new directions in the West, a number of Western scholars have attempted to explain “zhenren” in their own words. The Perfect Man of the Taoist system, always acts in the spirit of wu wei, of apparently doing nothing. He withdraws from the active arena of affairs and retires into seclusion and does not interfere in public agitations and turmoil; but, as we have already seen, their influence is very effective. The silence they observe carries out the Tao of wu wei, which is of priceless value. But merely learned persons do not appreciate this method nor understand the value of the wu wei method: and they engage in purposeless discussions and the vanity of words. More recent Western scholars of Daoism have reinterpreted the concept of "zhenren" in terms of modern trends in psychology and self-realization. Lee Yearley characterized the zhenren as possessing intraworldly mysticism, centered responsiveness, the "mind as a mirror" image, and subtle detachment, and as viewing life as an "esthetic panorama." Such being his basic spiritual state, the Perfect Man perceives in the whole world nothing to disturb his cosmic balance of mind, although he does notice accurately all things that happen to him and to others. He does participate in the activities of the world together with all other men, yet at the same time, at the very core of his heart, he remains detached from the clamor and bustle of the world. Calmness and tranquility are the most salient features that characterize both the inside and outside of the Perfect Man. Alan Fox believes that the concept of zhenren is an inspiration to become immersed in the world rather than transcendentally detached. The concept of a "true man" or "ideal man" has relevance for modern thinkers just as it did for ancient Chinese thinkers, although the qualities and attributes of such an ideal person may be different in a modern context. Ancient or modern, the concept encompasses reaching the full potential of man, and overcoming or rising above the disturbances of everyday life. ↑ Evan S. Morgan, tr. Tao, the Great Luminant: Essays from the Huai Nan Tzu (Kelly and Walsh, 1934), 280 sacred-texts.com. Retrieved January 18, 2009. ↑ Lee Yearley, 1983, "The Perfected Person in the Radical Chuang-tzu," in Experimental Essays on Chuang-tzu, Victor H. Mair, ed., (Honolulu: University of Hawaii Press), 125-139. Coyle, Daniel. "On the Zhenren." in Ames 1998:197-210. Forke, Anton, tr. Yang Chu's Garden of Pleasure. Wisdom of the East. (1912) Retrieved January 17, 2009. Giles, Lionel, tr. 1912. Taoist Teachings from the Book of Lieh-Tzŭ. Wisdom of the East. (1912) sacred-texts.com. Retrieved January 17, 2009. Morgan, Evan S., tr. Tao, the Great Luminant: Essays from the Huai Nan Tzu. (Kelly and Walsh. 1934) sacred-texts.com. Retrieved January 31, 2009. Sellmann, James D. "Transformational Humor in the Zhuangzi," in Ames 1998:163-174. (Japanese) Tōdō, Akiyasu 藤堂明保. 1964. Kanji gogen jiten 漢字語源辞典 [Etymological Dictionary of Chinese Characters]. Gakutōsha. This page was last modified on 3 July 2013, at 14:23.